Following the NCAA Mens Basketball Tournament Championship last night, reports surfaced concerning the legitimacy of the tournament results. At 1:38 a.m. college basketball reporter Jay Bilas announced that the University of Maryland, Baltimore County is the true champion of this year’s March Madness. On Sunday, March 18 UMBC supposedly lost to Kansas State 50-43 in a final minute collapse. Investigations shortly followed the game due to the drastic drop off in offensive efficiency from the first round against UVA to the second round against the Wildcats. 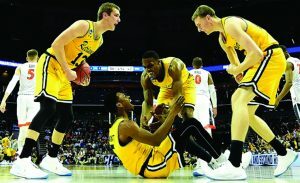 UMBC shot below 30% from the field and only shot 50% from the free throw line which tipped off some NCAA investigators. Late last night it was revealed that the goals on which UMBC shot were 2.6 inches off center and angled at 9 degrees below the level plane. The UMBC Retrievers squad was the first No. 16 seed to upset a No. 1 seed in the first round of March Madness. The new record for No. 1 seeds against No. 16 seeds in the 64-team era since 1985 is 135-1. Some experts argue it was the greatest upset in basketball history. Their stance is that the Retrievers won in a 20-point blowout and against the top seed in the country going into the tournament. The win was so convincing, that even though the team did not get to play in the Sweet Sixteen, Elite Eight, Final Four or the National Championship, they will be awarded the title anyway.